Definition at line 22 of file LanaiDisassembler.h. Definition at line 43 of file LanaiDisassembler.cpp. References llvm::Address, decodeBranch(), DecodeGPRRegisterClass(), decodePredicateOperand(), decodeRiMemoryValue(), decodeRrMemoryValue(), decodeShiftImm(), and decodeSplsValue(). Definition at line 129 of file LanaiDisassembler.cpp. 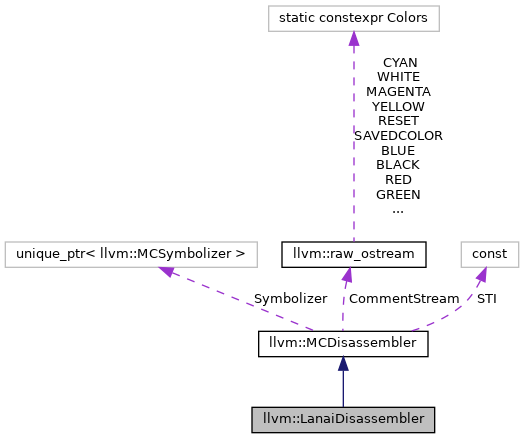 References llvm::X86Disassembler::decodeInstruction(), llvm::MCDisassembler::Fail, PostOperandDecodeAdjust(), readInstruction32(), and llvm::MCDisassembler::STI.